Digital advertising executives like me, who have made infinite pitches to Coca Cola, would know what a big deal it is to see a Coke campaign live J even if it is a static simple promo like the latest Coke and Meals campaign. 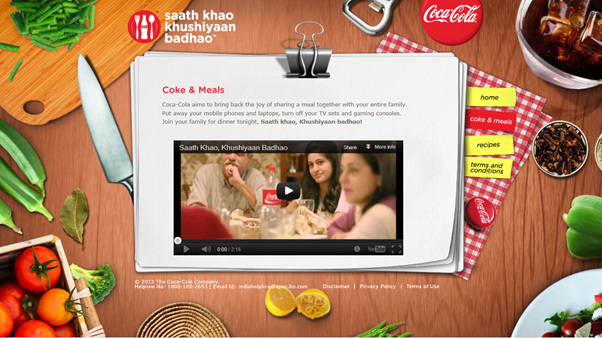 The overall campaign aims to bring back the concept of a family sharing a meal together, sharing happiness and of course a Coke. The three pager microsite brings together the new TVC, recipes and a new contest where participants need to upload recipes and winners get featured on TV with celebrity chef Sanjeev Kapoor. The microsite is simple but well designed and laid out. A lot more could have been done with the contest and overall campaign on digital platforms but at least this is a start.